The legendary Egyptian king Tutankhamun, commonly known as King Tut, died of conditions including malaria and complications from a leg fracture, according to a study published this week in the Journal of the American Medical Association. Tutankhamun's tomb was discovered in 1922, but his life remains shrouded in mystery, and not much is known about him. He ruled during the 18th Dynasty, from 1336-1327 B.C., and is believed to have died young. Forensic analysis of his mummy has put his age of death at about 17 to 19 years. 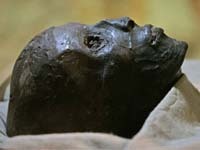 In the study researchers used anthropological, radiological and genetic testing to examine Tut and 10 other bodies mummified over a two-year period during Tut's dynasty. CNN news agency has contributed to the report.